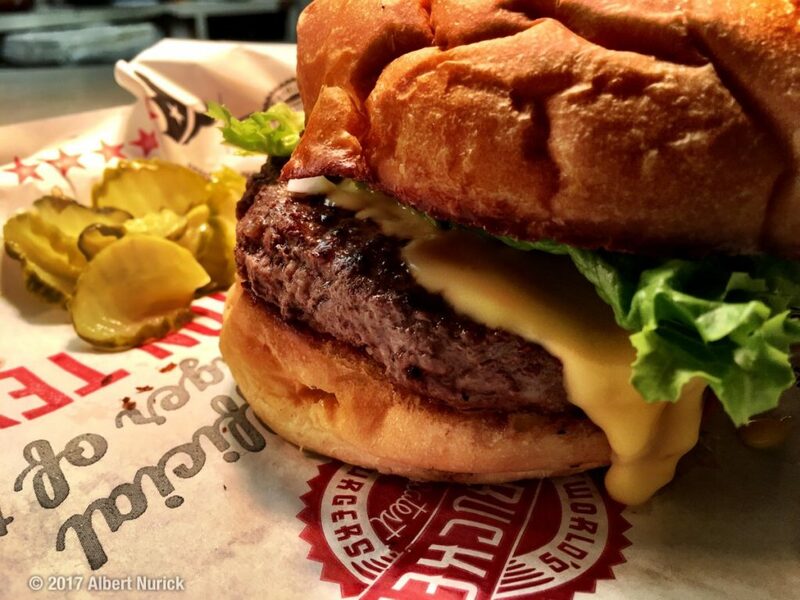 As others have come and gone, Fuddruckers has been doing their thing for decades. There’s a reason. It’s not a secret that we love great burgers. We make it our mission to check out all the new spots that are rumored to have a hamburger that is worth investigating. We’ve found some great ones… and some not-so-great ones. The thing is, when you’re focused on what’s new, you forget about the spots that have been around for a while. If a restaurant stays in business for over a decade, there’s a good reason. Running a restaurant isn’t easy, and staying profitable enough to stick around for a decade indicates that you’re making a lot of customers happy on a consistent basis. While Fudd’s has added options over the years, the basic formula remains simple. Big burgers (1/3, 1/2, or 2/3 lb patties, with smaller ones available for kids) with your choice of fresh toppings, served atop fluffy, eggy buns baked in-house. And the formula works. We ordered a basic 1/2 lb burger, and accessorized it ourselves from the condiment bar. The result was a big, juicy burger, cooked precisely to order (medium rare) and topped with melted cheese and fresh veggies. Flavor was very good; many of the of-the-moment burger joints could learn from Fudd’s spot-on execution. The burger was lush, beefy, and juicy, and the veggies added to the flavor rather than masked it. Less successful was the quarter-pound “manager’s special” burger that was offered for those with smaller appetites. The patty came out seriously overcooked. The manager did offer to replace the burger, but at this point, our companion wasn’t in a burger mood anymore. Our conclusion: Stick to what Fudd’s does best, which are big burgers. We feel negligent for ignoring Fuddruckers in favor of the hot new burger place on every corner. And while we’re not going to abandon our search for the next great thing, we’re putting Fuddruckers into our regular burger rotation.